Girl Online is the story of Penny, a 15 (almost 16!!) year old girl living in Brighton, England. When we meet Penny, she is the anonomyous writer behind Girl Online, a blog that is gaining legions of followers by the minute. The blog started as a way for Penny to openly and honestly express herself without the shame and embarrassment associated with doing so when you are in your teens. It is in her blog that Penny finds her place in the universe, getting advice from her many followers as well as giving it on a myriad of topics. In real life, Penny has two very supportive parents, a brother in uni and a true best friend named Elliot who happens to share a bedroom wall with her. At school, Penny has a "best friend" named Megan, who slowly throughout the novel becomes something that Penny realizes she has outgrown. These characters play an important role in Penny's story, but none quite as much as Noah, a mysterious Rock God (her words, not mine) who stumbles into her life in the most unexpected way (but don't they always?). I was so pleasantly surprised by how much I loved this novel. I had pretty realistic expectations going in, as I do with all YA novels. There is something so refreshing about reading a YA novel that was written by someone who is essentially a young adult. With most YA novels targeted specifically at young girls, the language is very specifically things that adults have been told are cool. 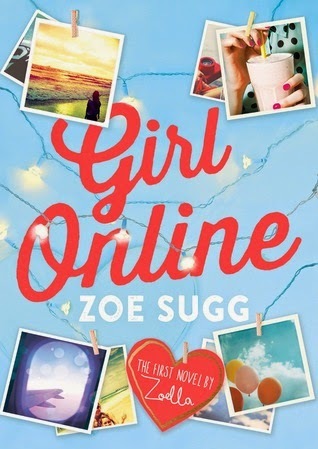 Zoe manages to capture the language used by young girls and turn it into something that doesn't feel patronizing, even to someone like me who has graduated from college and began living in the real world. There are a plethora of pop culture references in the novel that stood out to me, because they will only serve to age the novel in years to come. That being said, I think I can safely say that Zoe Sugg did not set out to write the next great coming of age story to span the decades in its profoundness. The story follows all the common YA plot points, a young girl who doesn't quite feel like herself at school, with a quirky best friend, who sets off on an international adventure and meets a mysterious but perfect guy who isn't all that he seems. The interactions between the characters seemed more genuine to me than they have in other stories similar to this one, and I appreciated that. The most interesting thing about this novel is the incorporation of the internet as such a driving force in a modern teen's life. Being that Penny is a blogger, the internet is especially prevalent in her world, but she also experiences cyber bullying, which is a real and unfortunate problem associated with the digital age. Bringing up these issues in a novel that is reaching so many young minds is very brave, and completely necessary. Zoe's own struggles can be found throughout the story, as I happen to know that she suffers from panic attacks and chronic anxiety, just like her protagonist does in the novel. Bringing these issues to light and discussing ways to cope with them is my favorite thing about the story. For a young reader to identify with this character and to be able to put some of the techniques discussed to use is an invaluable bonus to take from this otherwise cute and light novel. This issue is heavily present in our society and the stigma associated with it prohibits a lot of young people from seeking the help that they need. This novel opens those doors a bit, and that is pretty great. Although the romance seems hard to believe at times, mainly in the reveal of Noah's "secret" life, I did find the courtship to be quite adorable. I smiled while reading this novel and that is all you can really ask for when reading something meant to be light and fun. Kudos to Zoe for capturing the excitement and confusion of falling in love for the first time. I feel proud, in a far off and removed way, that someone who is my age has been able to put together something that represents young girls in a positive way. Being that most YA novels are written by men and women in their 30s and 40s, it is impressive that someone who understands the feelings of a modern day teen is representing the YA community so appropriately, and on such a grand scale. There should be more young authors that are able to receive the exposure that Zoe has been granted, and her debut novel is a huge step in the right direction. Best Reader Audience: Female YA readers looking for something fresh! Final Rating: Four out of Five Bunny Bums! Want to follow Penny through the harrowing twists and turns of high school? Use this link to support The Lone Book Club!